Pharmacy Advantage provides pharmaceutical delivery services to some 18,000 patients in the U.S. With this, they fill 1000 prescriptions per day, 60% of which are specialty pharmaceuticals. Thirty percent of these specialty medicines are temperature sensitive. The Pharmacy Advantage team holds regular Quality Assurance (QA) meetings to review customer feedback. It was during one of these sessions that patient concerns about the temperature of shipments began to emerge. “We review both positive and negative comments in each meeting,” said Daniel Kus, VP of Ambulatory Services for Pharmacy Advantage. “We noticed that over a six month period, from spring into summer, we were receiving more and more calls from patients wanting to know if their medicine was still good.” The concerns arose, Kus noted, because packages might be delivered later on a hot summer day or left on the doorstep when no one was home. As a result, patients were unsure if the medicine would still be considered effective. Based on the findings of the QA meeting, as well as conversations they had recently had with Temptime, Pharmacy Advantage decided to participate in a pilot study along with four other specialty pharmacies. In this study, Temptime’s TransTracker®F temperature indicators were added to the packages of temperature-sensitive medications being delivered to patients with chronic diseases. Patient preferences and insights were then measured and analyzed. According to Kus, the results of the pilot study were compelling to Pharmacy Advantage. As a result of the study, Pharmacy Advantage did some further investigation into various temperature indicators on the market. They ultimately chose TransTracker based on their experience with the pilot study and patient feedback. At the same time they began to move forward with implementing Temptime’s temperature indicators, Pharmacy Advantage had an opportunity to meet with Cold Chain Technologies (CCT), a thermal packaging supplier. As a Temptime business partner, CCT provided a complementary evaluation of their packaging, which Kus described as an ancillary benefit of the pilot study and engagement. 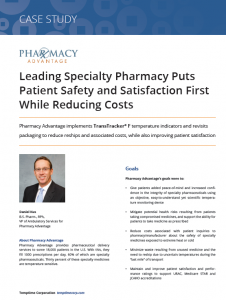 In 2013, Pharmacy Advantage began including TransTracker in all heat-sensitive or perishable pharmaceutical items delivered to a patient’s home. Additionally, the company made improvements to their shipping materials and packing processes. “These combined initiatives support Pharmacy Advantage’s goal of best practices in the last mile of shipping,” Kus said. Kus went on to note that eliminating just one compromised shipment more than covers the cost of temperature indicators for an entire year. With the average specialty pharmacy shipment valued at $2000 per month, and some as high as $5000 to $10,000, the financial payback alone is a significant incentive. “Beyond the cost of the medication, any disruption in patients taking medicines as they are intended is of major concern to both us and the health plans,” he said. “We don’t want to see clinical outcomes reduce, or ER visits and hospitalizations increase as a result of last mile problems that temperature indicators can simply and effectively address.” In addition to patient safety and cost savings, Kus cited a number of other benefits – including URAC, Medicare STAR and JCAHO accreditation as well as maintaining high levels of patient satisfaction to strengthen relationships with payors and pharmaceutical manufacturers. Based on the success of adding temperature indicators to shipments and improving packaging, Pharmacy Advantage is planning another study. In this case, they will be including a time and temperature monitor inside a select number of specialty pharmacy shipments that will record and transmit a temperature reading to Pharmacy Advantage every 15 minutes.